As Samsung's 7-inch iPad competitor the Samsung Galaxy Tab is officially launched across the UK today, network providers are slowly breaking rank to reveal their prices for the ultra portable computing device. 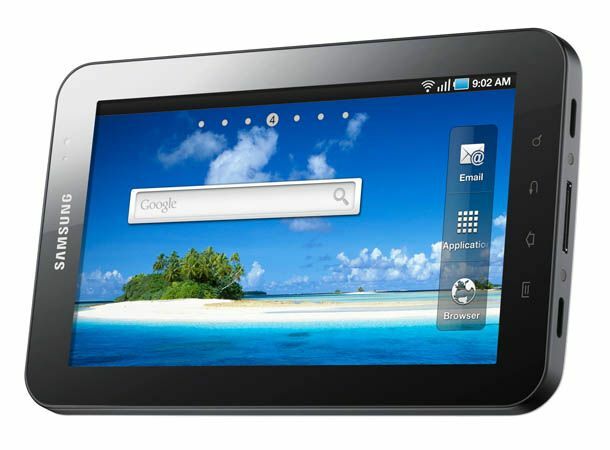 Three Mobile was the first to reveal its prices for the 1GHz, Android 2.2 powered tablet setting prices through the Carphone Warehouse that sees the Galaxy Tab available from as little as £99.99 upto £349.99 depending on contract length and inclusive data. With the device priced at a one-off £99.99, Three customers will have to fork over £40 per month for two years with 5GB of inclusive data for company. Whilst Three is currently not offering any voice plans for the Galaxy Tab, wannabe owners will be able to pick it up for £149.99 on a 24 month £35 per month deal with 5GB of data and 200 text messages thrown in for good measure. Whilst Orange has followed Currys and Amazon in offering the Galaxy Tab for £529 pay as you go, O2 has fallen wide of the competitive mark pricing its PAYG Galaxy Tab deal at £599. Orange's pay monthly contracts start from a £5 per month 1 month rolling contract with the tablet priced £529 to 1 year, £15 per month contract that will set customers back an initial £499 for 1GB of anytime data and 1GB of quiet time (12am – 4pm) data. Stay tuned to T3.com and the T3 Twitter and Facebook feeds for all the latest prices for the Samsung Galaxy Tab.